Condominium rental unit #702 accommodates up to 6 people with a king size bed in master bedroom, two twin beds in guest bedroom and sofa sleeper in living room. Entire unit has tile floors. Unit does not accommodate long term snowbird rentals. Enjoy the beauty of Destin`s beach from your private balcony. 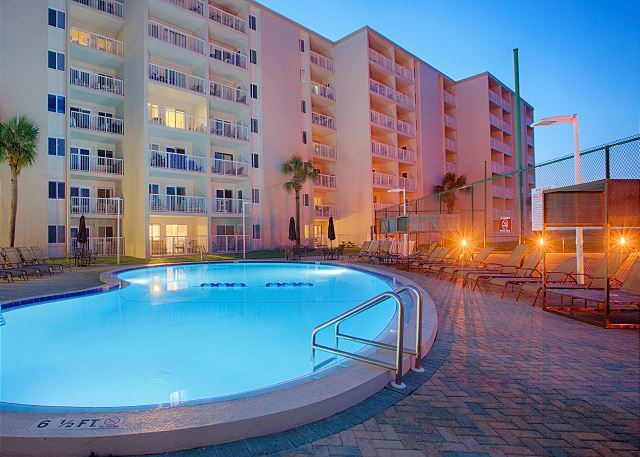 The pool, sport courts and complimentary beach chairs are just steps away. Make your reservations today! * Saturday to Saturday Peak Season* Take advantage of complimentary Xplorie excursions to enhance your vacation. My condo was clean and very comfortable! Amazing ocean view! I went to sleep every night with the window open listening to the waves, it was heaven. It definitely needs decor updating but that did not takeaway for our great experience. The only negative was you had to get up every morning at 7:30 and get your chair tag on a set of chairs if you wanted to be sure you were on the first row of chairs on the beach. I would have rather paid a extra fee to reserve them I like to sleep a little longer in the morning on vacation. Spent six nights. We were able to compare places as we had friends staying in other condos. Ours was wonderful for entertaining friends and decorated tastefully. The property association just needs to add lights to the tennis courts. Very nice location and place to stay. The unit was fine, but I would not stay in it again unless the screen is removed from the balcony. Great place for our needs! This was our 4th year at this location and we wouldn't keep coming back if we didn't like it! !